The Arborvitae Green Giant "Thuja standishii x plicata 'Green Giant' is a large, vigorous, fast growing evergreen. It has a natural pyramidal to conical form that boast dense, rich green foliage that darkens to bronze but only a little over winter. They make exceptional landscape trees, mostly used for screens, hedges, windbreak or single specimens. This variety is very tolerant to a wide variety of soils, but prefers moist well drained soil and fullk sun to partial shade. It is quite wind resistant but only once established. It can also handle limited snow and ice loads once fully estalished. Under ideal conditions you can expect this tree to grow up to 3 foot per year to a height of 50'-60' with a 12'-20' spread. This tree is readily available at most nursuries and in many cases even the local home improvement store. Make sure when planting that you space the trees far enough apart to allow room for them to grow and thrive. Recommended spacing falls in the 8' range, or 4' when staggered in rows. 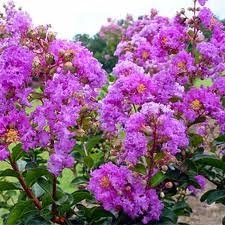 The Crape Myrtle is in the Lagerstromia family or Lythraceae and originates from China and Korea. The genus includes some 50 trees and shrubs varieties. Growing in an upright but bushy fashion, with smooth ribbed with a very attractive bark, that is pink and gray with green flecks. The bark appears to peel and adds great interest even during winter when the rest of the tree is bare. The leaves are opposite or alternate and grow in threes. 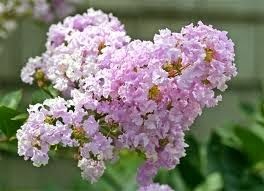 The flowers which are known for being long lasting, bloom in the summer and vary from White, Pink, Purple, and Scarlet. It grows commonly from Pennsylvania and Delaware to Texas and North through the Mississippi Valley into southern Illinois, only occasionally is it found as far West as California planted as a ornamental tree. 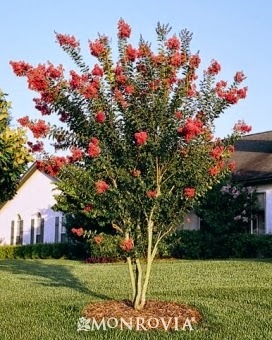 These trees are commonly planted in both residential and commercial landscapes. The fruit is a capsule shape which is green when young, aging to a harder dry brown to black color. When dry the fruit splits it releases small winged seeds. The "Tree Circus" originally opened in 1947, as a roadside attraction in Scott's Valley California. Axel Erlandson a bean farmer who pruned, grafted and trained the trees into various shapes as a hobby to amuse himself and his family, went to his grave holding the secrets of his technique. Most of his work was performed behind screens to protect his secret methods from the potential spy! Since his death in 1964 many have tried to recreate his work unsucessfully, so this method of privacy seems to have paid off. Sadly now it seems this type of tree "training" talent may never be seen again. Millionaire Michael Bonfante purchased the trees and transplanted them to his amusement park Gillroy Gardens in 1985, where you can still see them today. In the winter of 1984 the trees were all carefully hand dug and boxed. On November 10th 1985 they began their 80 mile journey to their new home a trip that required many permits and the help of 20 local/state agencies to pull off. Gilroy Gardens is in Gilroy, California and is home to 24 trees from Axel Erlandson's orginal "Tree Circus". Some of the trees formerly on display have been moved to private areas of the park for extra care and attention due to decline. Hopefully one day we will be able to see them come back on display! Junipers or Juniperus communis is the most widespread species of tree species in the world. The low growing scrubby versions have the Northern most range of the species. As a whole Juniper is found from Alaska to Greenland to Iceland, all across Europe and Asia circling around to the Bearing Sea and south through America to the Olympic mountains, the Sierra Nevada in Arizona and New Mexico and in the east to North Carolina. In most of America it is a low shrub except in a few eastern locations where it can grow to 15 ft tall. Throughout other parts of the world the Juniper grows in more of a tree form and can reach heights between 60-130 feet tall. The number of varieties of Juniper is much disputed with numbers varying from 52 to 67. Because of their evergreen habit, diversity is shape and size, relatively low maintenance and other desirable qualities, it is commonly used in landscaping projects as ornamentals plantings. They are evergreen with needle-like and/or scale-like leaves. They can be either monoecious or dioecious. The female seed cones are very distinctive, with fleshy, fruit-like coalescing scales which fuse together to form a "berry" ike structure, 0.16–1.06 in long, with 1–12 unwinged, hard-shelled seeds. In some species these berries are red-brown or orange but in most they are blue; they are often aromatic and can be used as a spice. The Berries are used as a spice in a variety of cooking styles but are best known as the primary flavoring in Gin. Juniper Berry sauce is commonly used in wild game dishes such as quail, pheasant, rabbit and venison. The berries are also the primary flavoring in Sahti style beer. The smoke from burning of Junipers is used to bless or cleanse the home during Hogmanay - or The New Year in Scottish and Gaelic tradition. Juniper Berries are steam distilled to produce Oil of Juniper. Tennessee, Northern Alabama and Southern Kentucky are the centers for this activity using the Juniperus virginiana variety. Juniper essential oil promotes and improves blood circulation. It also helps in the removal of toxins like uric acid from the body. Historically, Juniper essential oils were a well known antiseptic and people often during war time were treated with it. It is also recorded to be used to cleanse/treat both the mother and child during difficult labors. Juniper Oil is astringent and has been used holistically to treat many ailments as well as clense the body of toxins. It is commonly used in blending processes- or the combining of natural oils for health benefits. The Red Mulberry is a medium sized tree with a rounded crown. The leaves are dull and dark green in color. They are common in throughout the eastern US but not in the Northeast. The fruits are dense cylindrical clusters of tiny berries. The color is dark purple and they are sweet and juicy when ripe. Though not commonly sold like Cherries or Apples they are a widely enjoyed tree crop. Angel Oak Tree Park is located on Johns Island with no admission charge. The park also has a gift shop and picnic area. On Johns Island stands the majestic Angel Oak. Estimated to be between 400-500 years old; the tree towers 65 feet high and has a circumference of 25.5 feet. Its area of shade is 17,000 square feet and its largest limb has a circumference of 11.5 feet, and a length of 89 feet. Live oaks are not particularly tall trees, but have wide-spreading canopies. Only in the very old specimens do you find massive limbs resting on the ground, as you do the limbs of the Angel Oak. The City of Charleston acquired the Angel Oak Park in 1991. The Angel Oak has come to symbolize Charleston. It is a Southern live oak located in Angel Oak Park, on Johns Island near Charleston. The Angel Oak Tree stands 66.5 ft (20 m) tall, measures 28 ft (8.5 m) in circumference, and produces shade that covers 17,200 square feet (1,600 m2). From tip to tip Its longest branch distance is 187 ft. The Angel Oak Tree is thought to be one of the oldest living things in the country. The land where the Angel Oak Tree stands was part of Abraham Waight's 1717 land grant. The City of Charleston now owns the property. The Angel Oak Park is free and the tree should be added to any visit to Charleston, Kiawah or Seabrook Islands. Thought to be among the oldest living things in the United States of America, the tree stands on land that was part of Abraham Waight's 1717 land grant. The Angel Oak is located on John's Island near Charleston, South Carolina. The Angel Oak tree is featured prominently in the book, The Locket, by Emily Nelson. Meet the "Pecan" Tree. A large domed tree, native to Floodplains and River Valleys in the Southeast and Central Eastern US. It's leaves can get up to 20 inches long, and are made up of 11-17 opposite, toothed leaflets. The flowers are a greenish color, the males have slender catkins in cluster of 3's, while females have clusters of 2-10 on the same twig. The Pecan is widely planting throughout the Us for it's nuts, often in plantations. It flowers in the early spring and produces fruit in the fall. A pecan, like the fruit of all other members of the hickory genus, is not truly a nut, but is technically a drupe, a fruit with a single stone or pit, surrounded by a husk. The seeds of the pecan are edible, with a rich, buttery flavor. They can be eaten fresh or used in cooking, particularly in sweet desserts. Meet The "Chinaberry" Tree, this is a small tree with a dense crown. The fruits are round yellow and poisonous to humans. The flowers are small purple with 5 pale petals around a darker center tube and have a unplesant smell. It is naturalized in the South East United States and California. The Beech tree is a large spreading tree with smooth grey bark. The leaves are a dull blue-green which turn orange and yellow in the fall. Beechwood forests are common in the Eastern United States and they are also extensively planted for shade and ornamental trees in many landscapes. This tree flowers in the spring and fruits in the fall. The fruits are prickly brown burs which split into 4 lobes to reveal shiny brown 3 angled nuts-or commonly called beechnuts. Meet The "Eastern Red Cedar"
A medium sized columnar tree. Slender twigs are covered with aromatic green, scale -like leaves, running opposite in four rows. The fruits are soft and dark blue berries with a white bloom, they contain one or two seeds. They grow naturally in uplands and fence/hedgerows in most of the Eastern United States. They are also commonly planted in more formal landscapes as an ornamentals. The Honey Locust is a large deciduous tree with an open spreading crown and branched spines growing from the trunk and branches. The flat brown hairy pods are often a foot or more long and twisted in appearance. The leaves have 7-16 pairs of leaflets. Flowers are bell shaped and grow in small upright clusters. This tree grows naturally in many habitats throughout the Eastern United States. The cultivated forms often lack the prickly spines that many tree workers dread working around! With large White or Pink Flowers in the early spring, the Flowering Dogwood is a welcome and familiar sight after a long winter. The flowers are generally 3-4 inches across and are made up of 4 large bracts, surrounding a mass of tiny yellow-green true flowers, appearing before the leaves. The leaves turn bright red in the Fall. The fruits are small oval, shiny red berries that appear in the Fall. They grow in tight clusters at the end of a long stalk. The flesh of the fruit is mealy and bitter and encloses 1-2 seeds. The Flowering Dogwood is a small spreading tree commonly found along roadsides, old fields and in broadleaf forests throughout the Eastern United States. It is very commonly used as an ornamental in both residential and commercial landscape settings. It's West Coast relative is the Pacific Dogwood. The Sycamore tree is a large spreading tree. The leave have 3 or 5 shallow lobes with large teeth. The Sycamores leaves are often confused with the Maple as the shape of the leaves are similar. They have fruiting catkins that are round and brown, usually hanging on a long stalk. They grow naturally near streams and lakes, in swamps and floodplains, mixed forests and most of the Eastern United States. The wood is light brown, tinged with red. It is very heavy, weak, and difficult to split. Largely used for furniture and interior finish of houses, butcher's blocks. It is not commonly used for firewood since it is hard to split and creates a dust when cut that is irritating to both the skin and lungs. An American Elm that is approximately 90 years old. It is located in the heart of downtown Oklahoma City. It survived the bomb attack on the Murrah Federal Building on April 19, 1995. This boming was the most destructive act of terrorism on American soil before September 11, 2001, the bombing killed 168 people and injured hundreds more. Before the bombing, the tree provided the only shade in the building’s parking lot. It is said that people would arrive early to work just to be able to park under the cooling shade of the tree’s branches. After the bombing, the tree was partially cut down to recover pieces of evidence embedded in it from the force of the devestating bomb. Investigators were successful in recovering evidence from the tree’s trunk and branches. The Oklahoma City National Memorial and Museum was created to honor “those who were killed, those who survived, and those changed forever” by the 1995 bombing. Hundreds of community citizens, surviving family members who lost loved ones, survivors, and rescue workers came together to write the mission statement for the memorial. It was decided the “one of the components of the Memorial must be the Survivor Tree located on the south half of the Journal Record Building block.” The Memorial design was unveiled in 1996 with prominence put on the remarkable elm. With this, the Survivor Tree has become a symbol of human resilience. Today, as a tribute to renewal and rebirth, the inscription around the tree reads, “The spirit of this city and this nation will not be defeated; our deeply rooted faith sustains us." We have all heard of the Cherry Blossom Festival in Washington DC, but have you ever heard of the stunning and magical Cherry Blossom Tunnels in Bonn Germany? For a few short weeks each year the cobblestone streets of Bonn Germany become flower encased tunnels of beauty as a result of the Mature Cherry Blossom Trees flowering season. At the end of this magical time the streets are covered with a "carpet" of fallen petals. Meet The "Chinchona" Tree, the national tree of Ecuador and Peru. The Cinchona is a medicinal plant known as a source for quinine, a naturally occuring white crystalline alkaloid that has analgesic and anti-inflammatory properties. Discovered by Peruvian natives quinine has been recorded in use medically since at least the 17th century. Meet The "Cedars of Lebanon & The Cedars of God"